Here is the diagram from the end of part 6. Remember, the missing arrows have been left out deliberately because they correspond to transitions that are, in some sense, less fluid, less natural. Now it's time for the payoff. Since this series started with a question about the Time Reversal of Mills Mess, let's start our analyses with that. We need to start by working out what Mills Mess is on the diagram. On the way we'll see some of the limitations of the diagram, as well as the basic power of the technique. 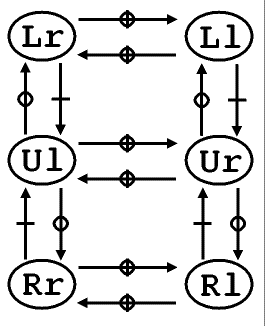 All catches are made more-or-less in the middle of Juggle Space. Remember that, and we'll come back to it later. 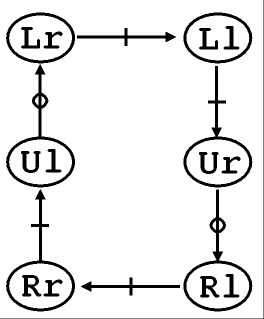 We know what type of exchanges occur on throws 1, 2, 4 and 5 because only one type is permitted by the state transition diagram. But what about the unknown exchanges? Throw 3 is with the left hand from the right side of the body and the catch is in the middle of Juggle Space. This means that between the throw and catch of the exchange the hand moves to the left. That makes it an inside exchange. Let's put that in, along with all the other transition types, just for the sake of completeness. So what was the point above about the catches? Well, at the very beginning we assumed that the exchange happened more-or-less in a single location. This isn't true in Mills Mess. When going from Ll to Ur with our inside exchange, the catch happens when the arms have uncrossed. This contrasts with the assumption that the throw and catch happen, and then the hands move to their new places. However, the notation doesn't really cover the actual hand positions. This is one of its major limitations, although there are ways of getting around it. In fact, when you're juggling, your Dwell Time tends not to be extremely long. This means that, in general, the catch happens close to the position specified by the next state, not this one. A specific example is the Ll to Ur transition. If we did have the long Dwell Time then the catch would happen with the arms still crossed. However, for Mills Mess the catch happens in the uncrossed position, as specified by the next state. We will assume from here on that this is, in fact, the case. We'll assume that the catch happens close to the position specified by the next state. 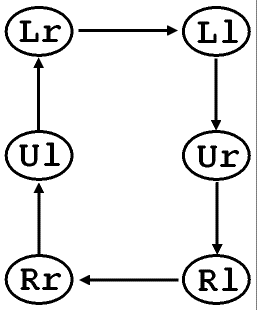 So, Mills Mess is a clockwise traversal of the diagram, following the "inside exchange" arrows whenever you have a choice. And the Time Reversal ?? That's the subject of the next page.